Glioblastoma (GBM), a WHO grade IV brain tumor is the most common and malignant primary cancer of the central nervous system with a grim median survival of 14.6 months upon diagnosis . Radiotherapy is the standard first line treatment for newly diagnosed patients with gliomas, but its effectiveness is limited given the tumor’s intrinsic resistance and propensity for recurrence [2, 3]. Although possible mechanisms have been attributed to GBM resistance to radiation treatments [4–6], the molecular mechanisms regulating radiation resistance of GBM are still unclear. 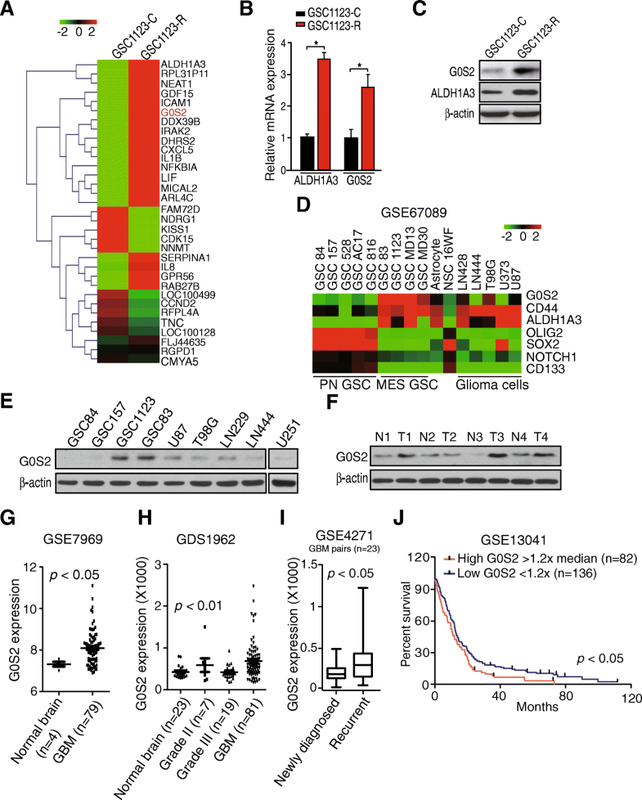 G0/G1 switch gene 2 (G0S2) was initially identified in lymphocytes through pharmaceutical stimulation of the G0 to G1 cell cycle transition [7, 8]. G0S2, a small 12 kDa protein, localizes to the mitochondria [9, 10], endoplasmic reticulum , and lipid droplets within the adipocytes . G0S2 has been shown to play various important roles in cellular functions such as cell proliferation , apoptosis , and oxidative phosphorylation  in humans and mice. 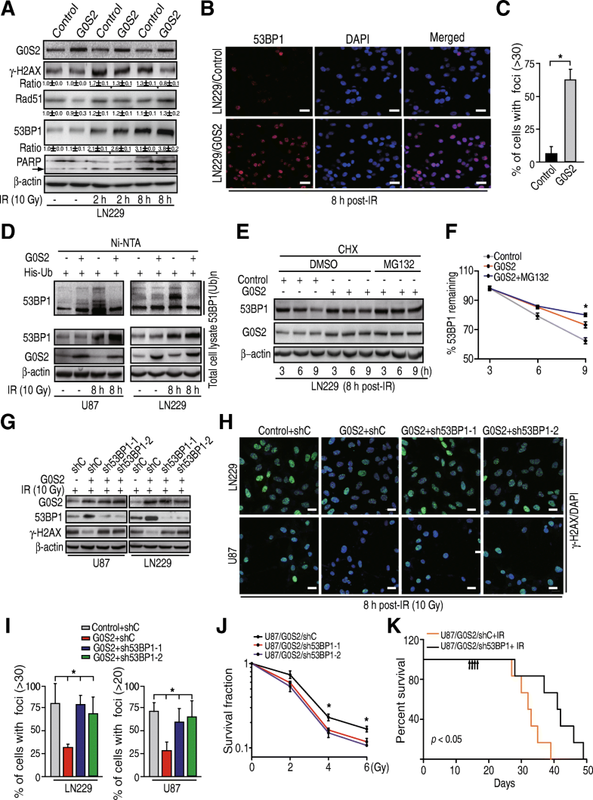 G0S2 is demonstrated to function as a lipolytic inhibitor in lipid metabolism to regulate lipid droplet turnover , and lipid droplets were identified as a signature of GBM and inversely correlated with GBM patient survival . Acumulated data have indicated that G0S2 is also involved in cancer [10, 15–17], including glioma . However, the function of G0S2 in cancers is still largely unknown. 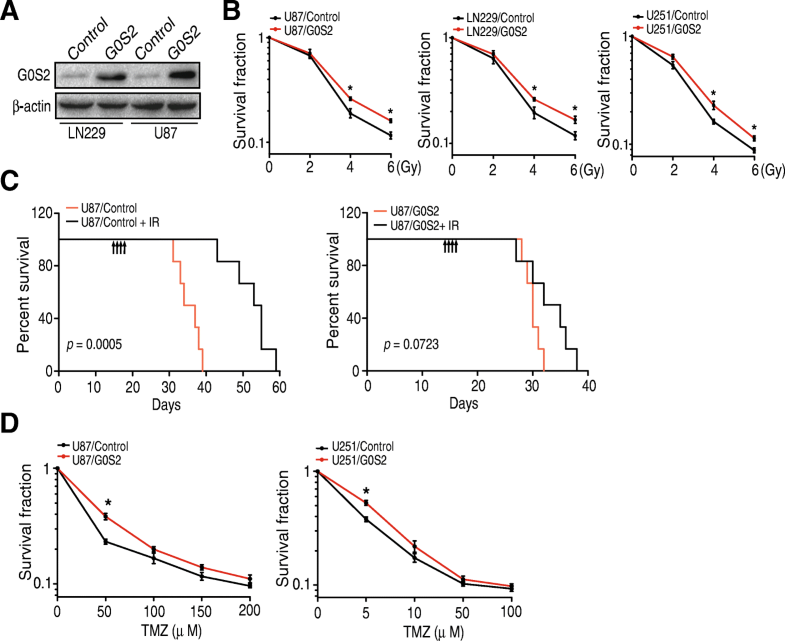 Accumulated evidence has established critical roles for the tumor suppressor p53-binding protein 1 (53BP1) in non-homologous end-joining (NHEJ) double-stand break (DSB) DNA repair [30–32], and Rad51 in homologous recombination (HR) DSB DNA repair . 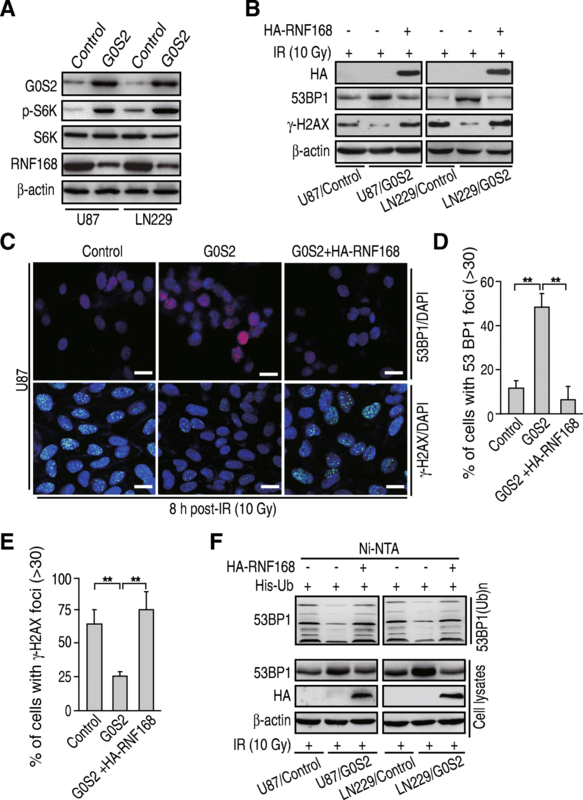 In addition, 53BP1 and Rad51 are important for glioma tumorigenesis [6, 34]. Based on our results above, we hypothesized that G0S2 enhances radiation resistance of gliomas through regulation of Rad51 or 53BP1. As shown in Fig. 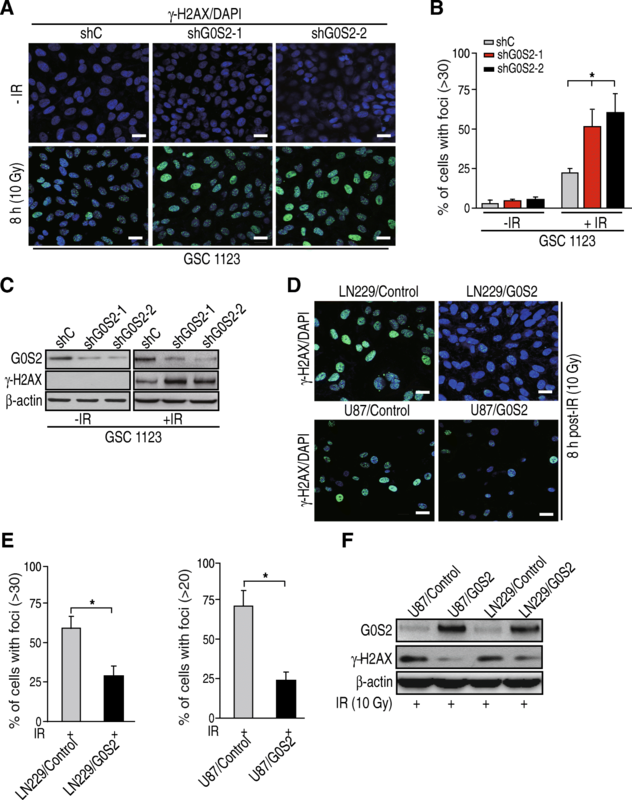 5a, LN229/Control and LN229/G0S2 cells without IR treatment showed basal levels of γ-H2AX, Rad51 and 53BP1 protein expression. At 2 h and 8 h post-IR, protein levels of γ-H2AX, Rad51 and 53BP1 were elevated in both cell lines. Compared with LN229/Control cells, the levels of γ-H2AX protein were significantly lower in LN229/G0S2 cells at 2 h and 8 h post-IR whereas the levels of 53BP1 protein were markedly higher (Fig. 5a). The levels of Rad51 protein did not show any differences in LN229/G0S2 cells compared with LN229/Control cells at 2 h and 8 h post-IR treatments, respectively (Fig. 5a). Immunofluorescent staining also indicated that the ratio of 53BP1 foci positive cells were higher in LN229/G0S2 cells compared with LN229/Control cells at 8 h post-IR (Fig. 5b and c). We also determined cell apoptosis in these isogenic LN229 cells in response to IR. As shown in Fig. 5a, levels of cleaved PARP, a marker of cell apoptosis  were markedly increased in response to IR. However, levels of cleaved PARP were not affected by overexpression of G0S2 compared with the controls. Lastly, we assessed the expression of 53BP1 mRNA in LN229/G0S2 cells compared with in LN229/Control cells in response to IR. However, we did not find appreciable changes of the levels of 53BP1 mRNA in these isogenic cells (Additional file 2: Figure S2), suggesting that alterations are regulated at the post-translational level. 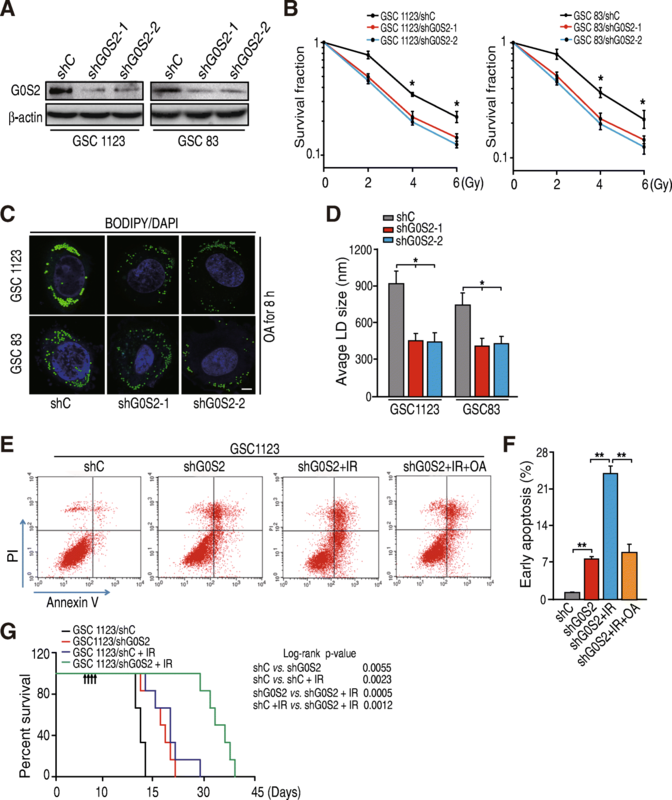 In sum, these results show that 53BP1 protein expression is regulated by G0S2 in glioma cell responses to IR treatment.